Jean-Paul Sartre, novelist, playwright, biographer, was undoubtedly one of the greatest philosophers of the 20th century. Above all, however, he was an embodiment of the engagé intellectual, active in a variety of political causes, as well as an individual who attempted to live his life in accordance with the philosophy he professed. 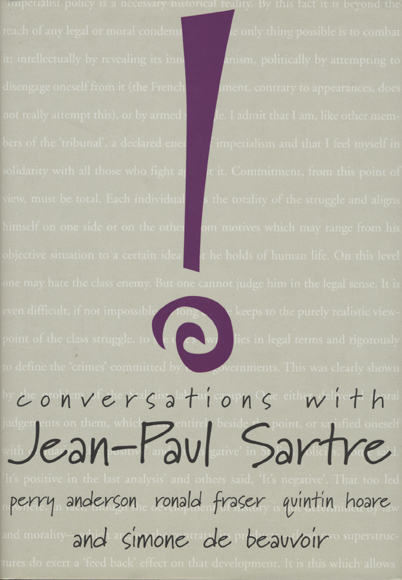 These interviews take Sartre on a wide-ranging tour of his philosophy and politics. Here we have Simone de Beauvoir challenging Sartre on his own attitude towards machismo and feminism; and Sartre responding thoughtfully to questions which range from Freud, Marx, and the drama of Bertolt Brecht to the Cultural Revolution, Stalinism, the May ’Events’ and of course, the US war on Vietnam. Their breadth remains a testimony to one man’s attempt to make philosophical sense of the tumultuous world around him.